The Latin word "raptor" means "one that seizes (grabs)". All birds-of-prey are carnivorous predators. The raptor family includes owls, hawks, kites, falcons, eagles, osprey, and vultures. 1. 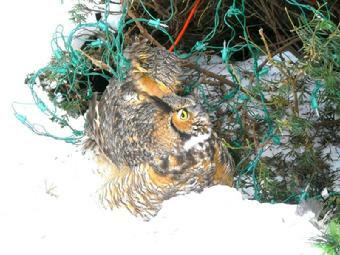 An unflighted bird may be captured with a large fishing net, a jacket tossed over it, or a large cardboard box placed over the bird. Baby birds can be returned to their nests (when accessible) without rejection by parents. 2. Wear thick gloves. Raptors use their taloned feet for defense, and most bite hard. Cover the bird's head to block vision for easier handling. 3. House the patient in a large cardboard box with flaps or cover (never a wire cage). Punch air holes in the box before placing the bird inside. Pad the box floor with newpaper, not towels (talons get caught). Store the box in a dark, quiet, climate-controlled room away from pets and family. Never play with a baby bird. 4. Do NOT offer any food or water unless instructed to by a qualified rehabilitator. 5. Contact a rehabilitator immediately. 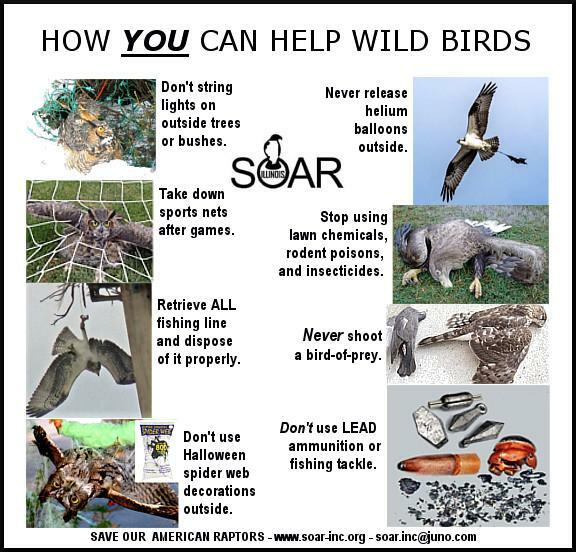 To locate one, phone your veterinarian, local or county police, or state Conservation (Fish & Game) department. Transport the patient in the box, and give a detailed and honest history. See the WORD link below for the rehabber list. Great Horned owlets usually leave their nest before they can fly. 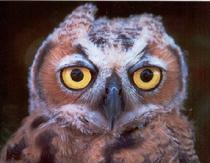 If you find an owlet on the ground, it may not be an orphan. Parents continue to care for their owlets on the ground. Don't rescue it unless it's in danger of being injured or killed. To keep it from harm, you may strap an apple basket or laundry basket to the nest tree trunk about ten feet from the ground. Place the owlet inside and the parents will locate the owlet when it begs for food. If the owlet is injured, seek help for it immediately. American Kestrels, Screech owls, Barred owls, and Great Horned owls often nest, lay eggs, and raise their young inside hollow trees. We highly recommend that any tree which is home (or has been home in the past) to nesting raptors be left standing for as long as safety allows. If tree trimming or removal must be done for safety reasons (danger of falling, hazard to power lines), do this before or after family season. 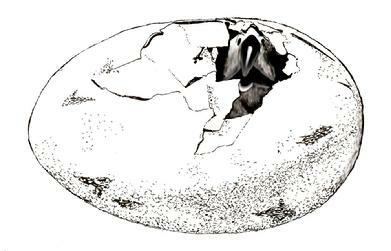 Owls nest very early (Feb, March), so always check inside a cavity before beginning any cutting activity. Check for large stick nests in branches which may contain eggs or hatchlings of Red-tailed hawks, Cooper's hawks, Broadwinged hawks, etc. Federal and state law requires that trees having active nests MUST be left undisturbed - and nests, eggs, or baby birds must not be removed. Most raptor babies leave the nest by late June/early July in Illinois, so removal can usually begin then. Please insist that the tree service you contract survey for active nests BEFORE they begin work. If a tree has fallen, and live babies are discovered in the tree cavity or on the ground, gather them up, follow the rescue instructions offered above. Contact a raptor rehabber immediately. Fallen unhatched eggs must be discarded immediately, and not be kept or incubated. SOAR receives calls from homeowners about hawks threatening or attacking their small pets when they're outdoors. Small kittens, puppies, miniature dog breeds like Chihuahuas, and caged pet birds can be at risk when left unsupervised and unprotected outdoors. Pet owners must realize that raptors are opportunists, just like coyote, foxes, and all other wild predators. It is the pet owner's responsibility to keep their small companion animals safe. During the winter, food becomes very scarce, and many raptors become desperately hungry. Their strong survival instinct forces them to switch from natural prey to any small animals that they can catch, which may include your small pet. In early summer, many newly-fledged birds are unfamiliar with natural prey and have undeveloped hunting skills. They may also see your small pet as an easy meal. Some young birds are simply playful and may execute mock attacks on small pets without doing them harm. 1. When small dogs/kittens are left outdoors unattended, keep them inside a fully-enclosed pen or run. Be sure to use the pen at night to protect them from owls. 2. When sunning pet birds outdoors, keep them inside a roomy cage, wire enclosure, or screened porch. Be sure their cage can't be knocked over, and doors are locked tight. Birds are natural prey for most hawks, falcons, and owls. Provide a hide box for your pet bird inside its enclosure so raptors can't hurt them through cage bars. Or build an outdoor aviary using small mesh wire (hardware cloth). 3. By putting food out for wild birds, squirrels, or rabbits, you attract a variety of wild predators to your yard, including raptors. 4. Stay with your small pet when outdoors. Raptors have a natural fear of humans, and will stay away if they see you near your pet. 5. It is illegal to shoot, poison, or trap a raptor to keep your small pet safe. Besides, if you remove one, another will simply take its place, and your pet continues to be at risk. Choose an effective and permanent solution. If you keep chickens and allow them to free-range, they WILL become prey for hawks, owls, coyotes, foxes, feral cats, stray dogs, etc. Like your other pets, it's your responsibility to keep them safe. A fully-enclosed wire pen is the safest place for them day and night. A period of free-ranging can be offered during the day under your direct supervision. IT IS ILLEGAL TO SHOOT OR TRAP ANY BIRDS OF PREY. You are subject to federal and state prosection for doing so. 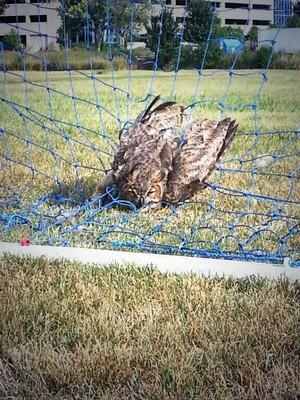 If you know anyone who is shooting hawks or owls, report them to authorities. Pigeon fanciers and racers frequently have problems with Cooper's hawks, Red-tailed hawks, and Great Horned owls (at night) entering their lofts and/or chasing their birds. Pigeons are a natural food source for these particular species. SOAR also maintains a pigeon loft and understands the potential for losses due to predation. We fully-enclose our fight pens to exclude ALL feathered and furred predators - including cats, raccoons, opossoms, rats, etc. which often raid lofts for eggs and unflighted young. (Unfortunately, birds-of-prey are often blamed for loft losses when the culprit is actually a four-legged predator.) 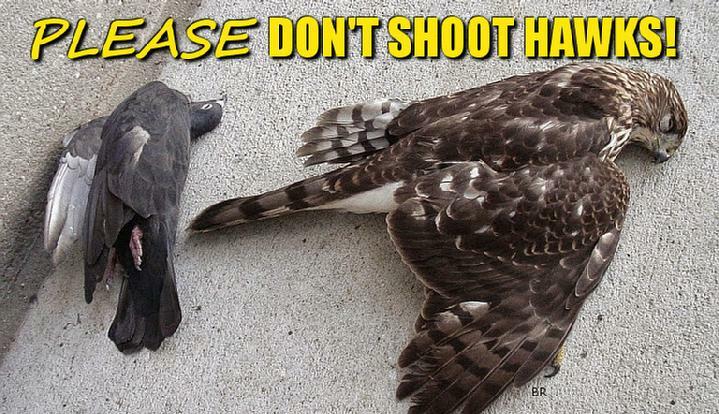 IT IS ILLEGAL TO SHOOT BIRDS-OF-PREY. Please call us for nonlethal options before you take aim! FISHING EQUIPMENT: Please collect and properly dispose of fishing line, hooks, and lead sinkers. SPORTS NETTING: Make it part of your equipment pack-up routine to take down game nets after games on fields and at home. OUTDOOR CHRISTMAS TREE LIGHTS: "Rope" lights are far safer to use outdoors. Traditional string lights wrap around legs and wings. BALLOON RELEASES: The string attached can wrap around legs and wings. TREE NETTING: Used to protect fruit trees from birds and insects, birds will find their way inside the netting and become trapped or entangled in netting. HALLOWEEN SPIDER WEB DECOR: Don't hang or drape webbing outdoors. 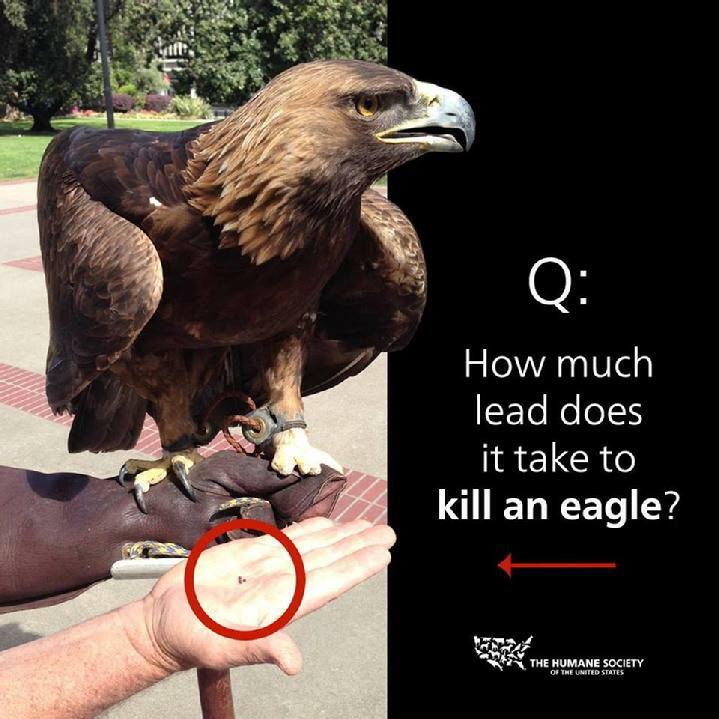 LEAD AMMUNITION AND FISHING TACKLE: PLEASE avoid using lead in any outdoor sporting activities. It is poisonous to ALL birds of prey when ingested.